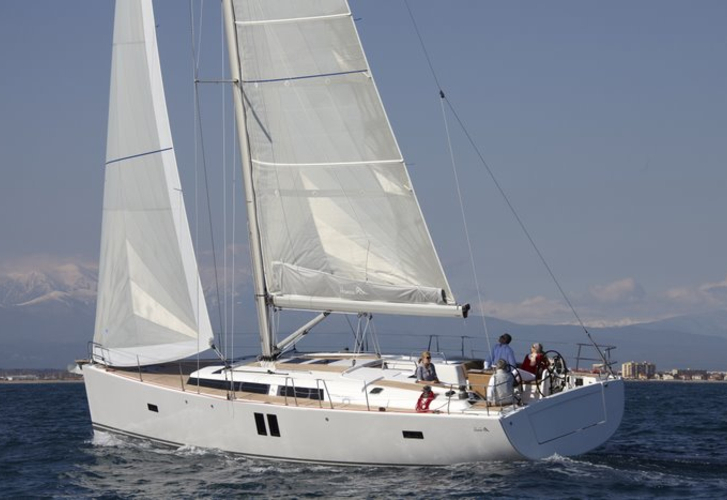 In 2011 has been built sailing boat Hanse 495 called Andrey. This yacht is available from base Kastela in surrounding area of Split in Croatia. You can take in up to 12 pax on the boat Andrey. Layout of beds is 12 (8+2+2). There are 5 bedrooms placed under yacht's deck. Andrey has 2 WC with showers. Use our search engine to find our offer here: Yacht charter Split. In this vessel is applied engine 75. With 15.40 m of lenght overall and 4.75 meters of width Andrey offers enough space for comfortable sailing. Hanse 495 Andrey is equipped with: Bimini top, Anchor electric windlass, Dinghy, Teak deck, Freezer, Self-tacking jib , Furling mainsail, Radio / cd player, Heating, Air conditioning, Bow thruster, Autopilot, Plotter gps in cockpit, generator, Outboard engine. . Caution is at the level of 2500.00 EUR. You can find other vessels by navigating to this section: Yacht charter Kastela.